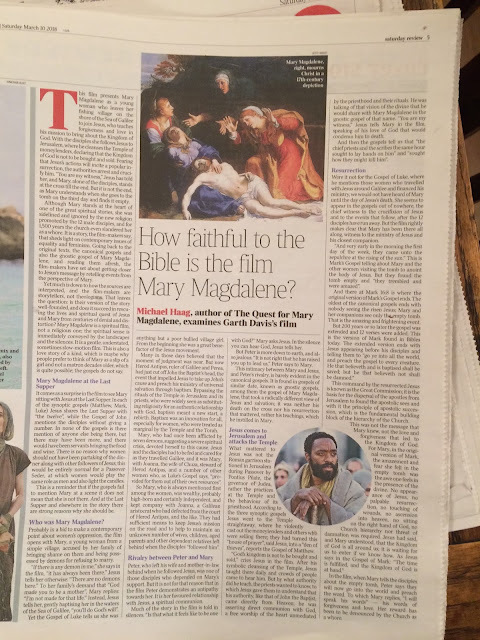 How faithful to the Bible is the film Mary Magdalene? This film presents Mary Magdalene as a young woman who leaves her fishing village on the shore of the Sea of Galilee to join Jesus, who teaches forgiveness and love in his mission to bring about the Kingdom of God. With the disciples she follows Jesus to Jerusalem, where he cleanses the Temple of money lenders, declaring that the Kingdom of God is not to be bought and sold. Fearing that Jesus’s actions will incite a popular insurrection, the authorities arrest and crucify him. “You are my witness,” Jesus has told her, and Mary, alone of the disciples, stands at the cross till the end. But it is not the end, as Mary understands when she goes to the tomb on the third day and finds it empty. Yet, although Mary Magdalene stands at the heart of one of the great spiritual stories, she was sidelined and ignored by the new religion promoted by the 12 male disciples and for 1,500 years the Church even slandered her as a whore. It is a story, the film-makers say, that sheds light on contemporary issues of equality and feminism. Going back to the original texts, the canonical gospels and also the gnostic gospel of Mary Magdalene and reading them afresh, the film-makers have set about getting closer to Jesus’s message by retelling events from the female perspective of Mary Magdalene. Yet much is down to how the sources are interpreted, the film-makers admit; and they are storytellers after all, not theologians. 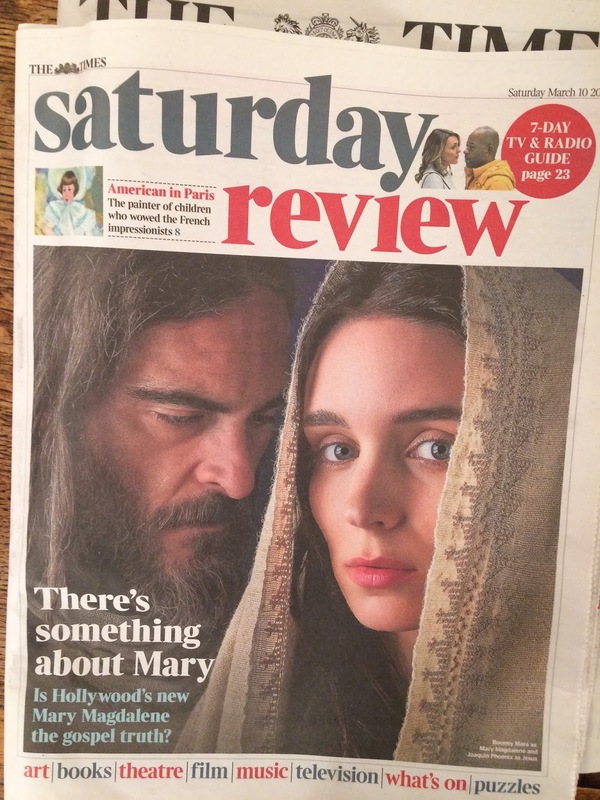 That leaves the question: is their version of the story well-founded and believable, and does it succeed in rescuing the lives and spiritual quest of Jesus and Mary Magdalene from centuries of denial and distortion? Mary Magdalene is a spiritual film, not a religious one; the spiritual sense is immediately conveyed by the landscapes and the silences. It is a gentle, understated, sometimes slow-motion film, its characters moving against a vast and dramatic landscape, shot in Sicily. This is also a love story of a kind, which is maybe why people prefer to think of Mary Magdalene as a slip of a girl and not a matron decades older, which is quite possible; the gospels do not say. It comes as a surprise in the film to see Mary Magdalene sitting with Jesus at the Last Supper. In each of the synoptic gospels (Matthew, Mark, Luke) Jesus shares the Last Supper with “the twelve”, while the Gospel of John mentions the disciples without giving a number. In none of the gospels is there mention of anyone else being there, but there may have been more, and there would have been servants bringing the food and wine. There is no reason why women should not have been partaking of the dinner along with other followers of Jesus; this would be entirely normal for a Passover Seder, at which women would be expected to play the same role as men and additionally light the candles. This is a reminder that if the gospels fail to mention Mary Magdalene at a scene it does not mean that she is not there. And here at the Last Supper and elsewhere in the story there are very strong reasons why Mary Magdalene should be there. Probably in a bid to make a contemporary point about women’s oppression, the film opens with Mary Magdalene, a young woman from a simple fishing village, accused by her family of bringing shame on them and being possessed by demons for refusing to marry. “If there is any demon in me,” says Mary Magdalene in the film, “it has always been there.” But Jesus tells her otherwise: “There are no demons here.” And to her family’s demand that “God made you to be a mother”, Mary Magdalene replies: “I’m not made for that life.” Instead, Jesus tells her, gently baptising her in the waters of the Sea of Galilee, “you’ll do God’s will”. But the Gospel of Luke tells us she was anything but a poor bullied village girl. From the beginning she was a great benefactor of the Jesus movement. Many in those days believed that the moment of judgment was near. But now Herod Antipas, who was ruler of Galilee and Perea, had just cut off John the Baptist’s head, the event that impelled Jesus to take up John’s cause and preach his ministry of universal salvation through baptism. Bypassing the rituals of the Temple in Jerusalem and its priests, who were widely seen as substituting religiosity for an authentic relationship with God, baptism meant a new start, a rebirth. Baptism was an innovation for all, especially for women, who were treated as marginal by the Temple and the Torah. Mary Magdalene, who had once been afflicted by seven demons, suggesting a severe spiritual crisis, devoted herself to this cause. Jesus and the 12 disciples had to be fed and cared for as they travelled around Galilee, and it was Mary Magdalene, along with Joanna, the wife of Chuza, steward of Herod Antipas, and a number of other women who, as Luke’s Gospel says, “provided for them out of their own resources”. So Mary Magdalene, who is always mentioned first among the women, was wealthy and probably high-born and certainly independent and kept company with Joanna, a Galilean aristocrat who had defected from the court of Herod Antipas, and the like. Together they had sufficient means to keep Jesus’s mission on the road and to help to maintain an unknown number of wives, children, aged parents and other dependent relatives left behind when the disciples “followed him”. Peter, who left his wife and mother-in-law behind when he followed Jesus, was one of those disciples who depended on Mary Magdalene’s support. But it is not for that reason that throughout the film Peter demonstrates an antipathy towards her. It is her favoured relationship with Jesus, a spiritual communion. Much of the story in the film is told in silences. “Is that what it feels like to be one with God?” Mary Magdalene asks Jesus. In the silence you can hear God, Jesus tells her. But Peter is more down to earth and also he is jealous. “It is not right that he has raised you up to lead us,” Peter says to Mary Magdalene. This intimacy between Mary Magdalene and Jesus, and Peter’s rivalry, is barely evident in the canonical gospels. It is found in gospels of similar date and known as gnostic gospels, among them the gospel of Mary Magdalene, that took a radically different view of Jesus and salvation; it was neither his death on the cross nor his resurrection that mattered, rather his teachings, which he instilled in Mary Magdalene. What mattered to Jesus was not the Roman garrison stationed in Jerusalem during Passover by Pontius Pilate, the governor of Judea, rather the practices at the Temple and the behaviour of its priesthood. According to the three synoptic gospels, Jesus went to the Temple straightaway where he violently cast out the money lenders and others who were selling there; they had turned this “house of prayer”, said Jesus, into a “den of thieves”, reports the Gospel of Matthew. “God’s kingdom is not to be bought and sold,” cries Jesus in the film. After his symbolic cleansing of the Temple, Jesus taught there daily, and crowds of people came to hear him. But by what authority did he teach, the priests wanted to know, to which Jesus gave them to understand that his authority, like that of John the Baptist, came directly from Heaven; he was asserting direct communion with God, a free worship of the heart unmediated by the priesthood and their rituals. He was talking of that vision of the divine that he would share with Mary Magdalene in the gnostic gospel of that name. “You are my witness,” Jesus tells Mary Magdalene in the film, speaking of his love of God that would condemn him to death. And then the gospels tell us that “the chief priests and the scribes the same hour sought to lay hands on him” and “sought how they might kill him”. Were it not for the Gospel of Luke, where he mentions those women who travelled with Jesus around Galilee and financed his ministry, we would not have heard of Mary Magdalene until the day of his death. She seems to appear in the gospels out of nowhere, the chief witness to the crucifixion of Jesus and to the events that follow, after the 12 disciples have run away. But the film rightly makes clear that Mary Magdalene has been there all along, witness to the ministry of Jesus and his closest companion. “And very early in the morning the first day of the week, they came unto the sepulchre at the rising of the sun.” This is Mark’s Gospel telling about Mary Magdalene and the other women visiting the tomb to anoint the body of Jesus. But they found the tomb empty and “they trembled and were amazed”. And there at Mark 16:8 is where the original version of Mark’s Gospel ends. The oldest of the canonical gospels ends with nobody seeing the risen Jesus; Mary Magdalene and her companions see only the empty tomb. That is the amazing and frightening event. This command by the resurrected Jesus is known as the Great Commission; it is the basis for the dispersal of the apostles from Jerusalem to found the apostolic sees and with it the principle of apostolic succession, which is the fundamental building block of the hierarchy of the Church. In the film, when Mary Magdalene tells the disciples about the empty tomb, Peter says they will now go into the world and preach the word. To which Mary Magdalene replies, “I will speak his words” — his words of forgiveness and love. Her reward has been to be denounced by the Church as a whore.